Day 7. Today was a tough painting day for me. I started the day already anxious about fitting painting in and having time for some other commitments in the evening. And so, I started my day in the studio as usual right after breakfast. I can't say painting this was easy. "Afternoon Tea" was painted from some photos I snapped in Dubai while visiting the old souk with my friend. She is Somali and we gathered around her aunt's shop that day to have the delicious cardamon tea just before maghrib, hence the title. I love the contrasts in the black and white, as well as the colorful background. And I am pleased with the overall product. But, today especially, I'm noticing a resistance in my hand. It is like I don't want to perfectly render facial features anymore. After all, I am a self-professed abstract artist. These are the most realistic paintings I have done in years and it's breaking me somehow. I'm not quite sure what's going on here or what the next three weeks will look like. I feel like I may veer into abstract faces with a whimsical, illustrative style. Or even abstract figures with no faces at all. Just blank voids. This seems more natural than what I have been doing these last few days. I'm struggling to find my voice in this challenge and that's mainly because there is no downtime. By the time I post the day's painting, the day is over and I'm trying to piece together what will be my assignment for the following day. If any of you out there have done the 30 in 30 painting challenge before, or doing it now, is this how it's supposed to feel? Am I outdoing myself here aiming for 30 perfect paintings? I'm a bit late with this blog post, moving and all, but I am still so thrilled to tell you guys: I've been featured in The National, a UAE multi-platform news and media organization! I was interviewed by Marina Iordan of My Velvet Instant, and published by Anna Seamen. A: Absolutely. I am primarily interested in colour and combinations of colour in my work. This is most effectively achieved in abstract painting, but it can also be used in representational art. I am always pleased when people comment on my paintings with statements that start with “This makes me feel...”. Art should make you feel something and by infusing color into my abstract pieces, I am having a conversation with every person who sees my work. I've been eyeing palm trees for months now. Maybe because I grew up in New Jersey and used to deciduous trees, or maybe because they remind me of sun and vacation. The intricacies in each tree makes me stare at them forever. I always try to take snaps on my iPhone for inspiration. But this painting was designed purely on my own imagination. I then toyed around with a few color options and then faced my canvas to make this a reality. 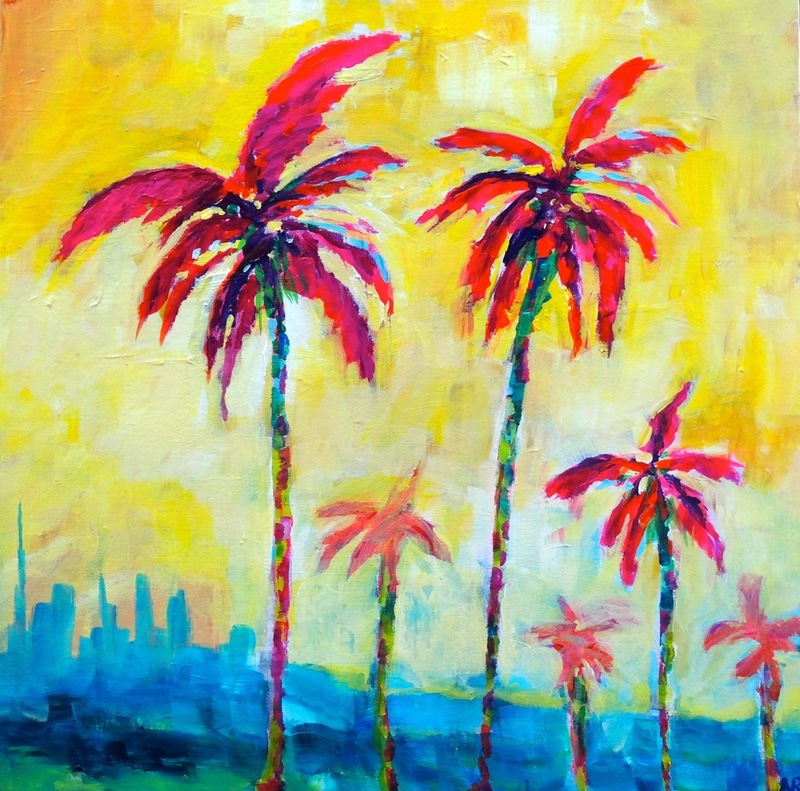 I'll admit, painting palm trees intimidate me. Not even a little bit, a lot. It seems like a simple easy thing to paint, right? But after observing them for so long, I know they're anything but simple. Fortunately, this painting sold the same day I posted it. The new owner will be a teacher from the US here in Al Ain, UAE. I'm so glad she loved this one as much as I do!